As the Antarctic ice sheet melts, warming of the atmosphere will be delayed by about a decade but sea level rise will accelerate, according to new research scheduled for advance online publication in the journal Nature. 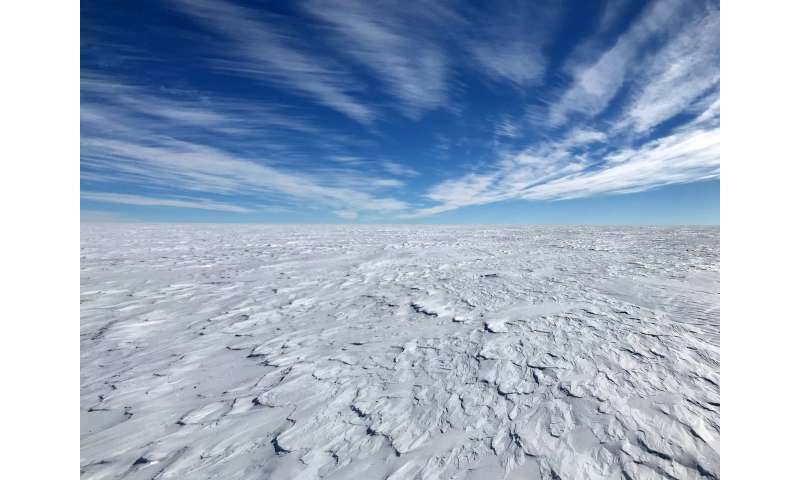 The study is the first to project how the melting of the Antarctic ice sheet will affect future climate, said first author Ben Bronselaer of the University of Arizona, adding that current climate models do not include the effects of melting ice on the global climate. "Warming won't be as bad as fast as we thought, but sea level rise will be worse," said Bronselaer, a postdoctoral research associate in the UA Department of Geosciences. "No one had looked at the big picture of what Antarctic ice sheet melting means for the global climate," he said. Adding the melted ice into the team's model indicated that the global temperature would increase by 2 degrees C (3.6 F) by the year 2065, rather than the year 2053, the team writes. The team's research paper, "Change in future climate due to Antarctic meltwater," is scheduled for online publication in the journal Nature on Nov. 19. A complete list of coauthors and their affiliations is at the end of this release. Russell leads the part of SOCCOM that is charged with improving how the Southern Ocean is represented in the computer models of global climate. The Southern Ocean is the ocean that surrounds Antarctica. To test that idea, Bronselaer ran a climate model with and without the ice- sheet melting included. The team included researchers from NOAA's Geophysical Fluid Dynamics Laboratory in Princeton, New Jersey and from Princeton University. The scientists used NOAA GFDL's climate model called ESM2M and tested the simulation over the time period from 1950 to 2100. Another SOCCOM team that has deployed robotic floats throughout the Southern Ocean that are gathering temperature, salinity, and biological and chemical information about the ocean. People who have no scientific background will surely be intimidated by this. Those with a scientific background will also be alarmed. Another 10 inches by 2100 is not good. Are you feeling very intimidated? Are you saying you have no scientific background? You didn't need to say that, it's obvious from your comments. If anyone had anything interesting to say, they'd have said it by now. Given the troll pocket above, what's the point?